Worldwide, coconut substrates are the go-to soil for strawberries and raspberries, and increasingly for blackberries as well. Blueberries have hardly been involved in this development; they are still largely grown on peat substrates – while for this plant, too, coconut is the ideal soil material. We can explain why. A soil with high acidity, i.e. a low pH value, is crucial for successful cultivation of blueberries. It is not a coincidence that the plant typically occurs on peat soils and that many growers in the Netherlands use peat-based substrates today. Five years ago, however, growers in Mexico experimented with other soil materials, and since then, the cultivation of blueberries on coconut substrates has taken a leap. 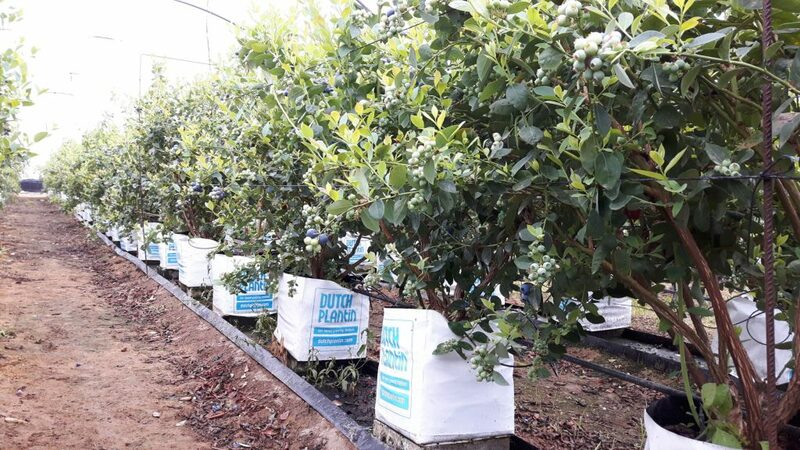 Not only in Mexico, but across Spain and Portugal as well, each year, a new set of growers switch over to growing blueberries on 100% pure coconut substrates. What makes the coconut material work so well is that it allows growers to fine-tune the pH value and ensure optimum conditions and for instance control irrigation more effectively than either field conditions or other substrates allow. The photo shows the results: these plants were planted in Spain in 2015 on a 100% pure coconut substrate. Thanks to a decent, stable-quality substrate they can continue to grow this way for many years! Another reason to switch over to coconut substrates is that they are a lot more sustainable than peat-based substrates. After all, once the peat has been excavated from the soil, it takes thousands of years to build up again. Meanwhile, coconuts grow on trees every year. And there are many more environmental benefits to using coconut substrates. Want to find out more? Contact us or simply leave a message through our account manager’s LinkedIn page.